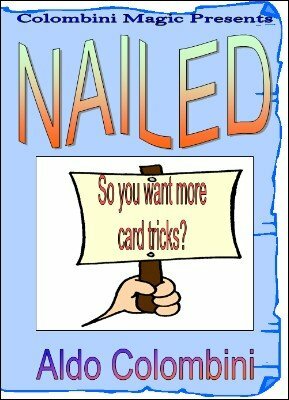 So you want more card tricks with a regular deck of cards? Here we go! ISOLATION (Aldo Colombini): The deck is cut into two. A card is selected from one half. A spectator finds it by picking two cards from the other half. 52-CARD MONTE (Karl Fulves): An entertaining, unique three-card Monte routine using the entire deck where at the end the deck changes color. Self working. UNBEATABLE (Aldo Colombini): You leave one card aside. Two indifferent cards placed face down in the deck, capture a Jack. Your card is turned and it is seen to be the other Jack. Then the two cards change into the other Jacks. AN ECHO OF A MIRACLE (Al Thatcher): Two selected cards are revealed in an impossible manner. You won't believe it. ELECTRIC (Aldo Colombini): You leave a card face down. The spectator finds two cards and one of them finds the 'mate' of your prediction. A POKER PLAYER'S PUZZLER (Nick Trost): A spectator finds the four Aces and, on the way, after an apparent mistake, the Royal Flush as well. TAKING CHANCES (Aldo Colombini): A spectator cuts any amount of cards. You produce two cards that reveal the amount of cards cut by the spectator. A CARD IS FOUND (Dai Vernon): A simple routine from the Professor. A card is selected and found by using other cards. Practically self working. MULTIPLE (Hideo Kato): A freely THOUGHT-OF card is found by the spectator himself! Clever idea. DOUBLE LOCATIONS (Aldo Colombini): Two freely selected cards are found with a color separation of the entire deck (the black is among the red and vice versa).